Cinematic sunsets and fine cuisine on the outskirts of town. 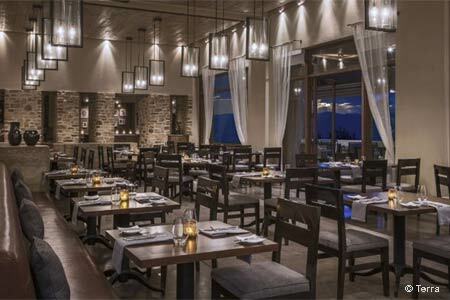 : Set in the Sangre de Cristo foothills with lovely views of the Jemez Mountains, Terra at the Four Seasons Resort Rancho Encantado serves fresh and inventive interpretations of American cuisine. Seafood is featured in dishes like popcorn-crusted scallops with raspberry gastrique and branzino with olive oil-crushed potatoes and a peppery saffron reduction. Tender meats are highlighted in the green chile braised short rib as well as lamb shank with citrus gremolata and pea risotto. The menu changes seasonally and emphasizes local and organic ingredients. The garden at Terra offers a pop-up chef's kitchen table among the fresh vegetables when they're in season. Whatever the time of year, don’t hold back on dessert --- the dark chocolate soufflé, served with a green chile cream, strikes the right balance between airy crust and gooey chocolate core, and the signature sundae is loaded with house-made churros and tequila caramel sauce atop dulce de leche ice cream.